This is a luxurious mountain lodge with majestic 270-degree long range views like no other, located in the exclusive gated community of The Lodges at Eagles Nest. 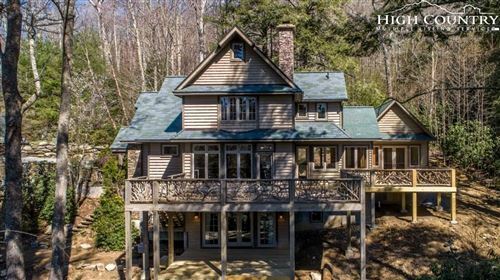 This rustically elegant home built in 2006 is situated on an estate-size homesite featuring approximately 8 acres, enormous rock outcroppings and multiple waterfalls. One waterfall in particular has a 40-foot drop, which can be enjoyed from the inside and out. All of which set the stage for the most awe-inspiring living experience, which is perfect for someone who enjoys privacy, the outdoors and a one-of-a-kind setting. Inside, you will find luxury living at its finest with an enormous amount of custom details, such as soaring ceilings, abundance of windows, custom fixtures, granite countertops, hemlock logs, two stacked stone fireplaces, gourmet kitchen with Viking appliances, en-suite baths with heated tiled floors, office, media room, bunk room, wine cellar and so much more. This extraordinary home is currently a fantastic luxury vacation rental. The Lodges at Eagles Nest offering amenities like no other is also located minutes from downtown Banner Elk and a short drive to Beech and Sugar Mountain.